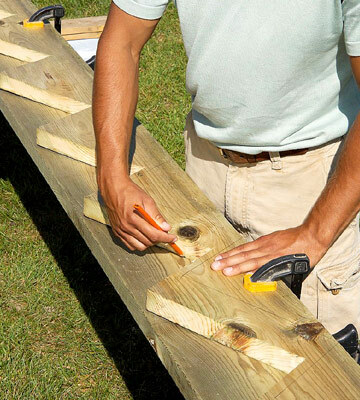 When people decide to take on the task of becoming a carpenter, one of the first things they try to learn is how to build a deck. While building a deck can be a fun and fulfilling project, simple mistakes could turn a fun project into a costly or even deadly nightmare. Here are 5 of the most common mistakes to avoid when learning how to build a deck. One of the worst mistakes to make when building a deck is to select the wrong building material. Often people buy the wrong wood or use nails where braces are needed, etc. Personally I have come across dozens of decks built with fencing material. What seems like a cost cutting method could add up to major costs in just a few years. Most fence material has square edges, which chip and break off under the slightest amount of foot pressure. This wood also tends to be knotty and often warps in any weather condition. One of the most confusing aspects of building a deck for an aspiring carpenter, is cutting the stringer. There is a little math involved that often causes first timers to make the mistake of cutting incorrect riser heights. All of the risers should be the same length except for the bottom riser. All of the other risers will lose the depth of the tread once it is put on so the bottom riser should be a tread depth smaller than the other risers. It’s an easy mistake to make when taking everything else into account. 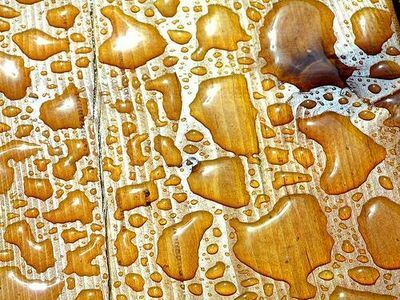 When a deck is built with pressure treated wood, it is recommended to avoid sealing it for 6 months. For some homeowners, six months can turn into a couple of years before they know it. 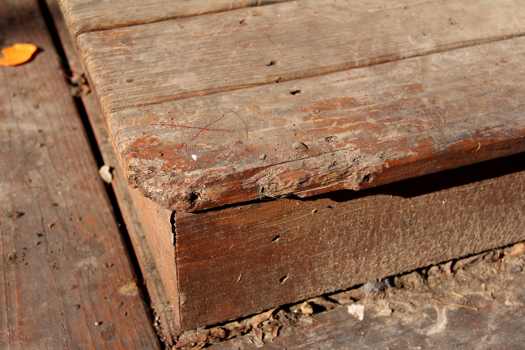 When a deck is not sealed, it will start rotting in a hurry. Make sure to properly clean and seal your deck and check it often to make sure it doesn’t need to be sealed again. To check your deck before you wreck your deck, pour a little water on it to see if it absorbs. If the water is absorbed, it is time to seal it again. A little maintenance goes a long way. More often than not, beginning carpenters make the assumption that separating the distance of beam splices between the different plies is important. While it can help if done properly, It is more important to make sure your splices sit on top of posts. Some designs make it possible to stagger the splices and sit them atop separate posts but if this isn’t possible, make sure sit your splices on top of your posts, even if they are only inches apart between plies. If you avoid this warning, you could be rebuilding after inspection. This mistake is actually a series of mistakes that many budding builders make. When building your deck, you want to make sure the water drains in an efficient manner. If the deck is attached directly to your house, it is important to use the proper flashing to make sure water doesn’t accumulate on the side of your house, rotting your structure. It is also important to leave a little space between your planks to allow for drainage. Last but not least, consider sloping your deck .25 inches for every 12 inches away from your house. Doing this will help keep water from accumulating on your deck. Building a deck can be a fun and rewarding experience as long as you plan ahead and avoid these and other costly mistakes. Happy Building! READ MORE CLIENT REVIEWS HERE ON THEIR WEBSITE K & S Contracting are Saskatoon’s Trusted Contractor for ICF Foundations..."They will get you back on solid ground!" What can laminate do for the walls in your home? I am so glad you asked! Laminate can add a great rustic feature wall in your bedroom. It can be used instead of flashy wall paper. It can provide your bedroom with a traditional headboard.